- Gloria J. Katch on 二月 19, 2016. Despite the gray clouds, blustery winds and occasional snow storms, there is no reason for the winter blahs and blues! There is always a hot concoction, toddy, or cuppa, as the Brits say, to combat the chills, put a spring back into your step and a smile on your face. The aromas from Spiced Apple Cider, Baileys with Hot Chocolate or Espresso can heat up any cold day. Hot Toddy’s are still popular, along with warm beers like Guinness that are tipped and poured even when St. Patrick’s Day is long gone. Mortlach Single Malt Whisky is another favourite to warm the cockles of your soul, and make any day a holiday. The list is only limited to your imagination, as many liqueurs and spirits are making a comeback, said Simon Hooper, a Brand Ambassador for Wirtz Beverage Canada and Diageo Canada, which is one of the largest producers of spirits, beer and wine around the globe. He compares his job to being a consultant where he does promotions, in-house training, cocktail development, and recommends what products and drinks would be suitable for certain establishments and events. He even recommended the drink menu last year for the Toronto International Film Festival. While the rich and famous may not be concerned with cost, most of us do keep our pocketbooks in mind. However, Hooper says Tanqueray Gin is about $45 a bottle, an affordable price for any type of celebration. New drinking trends have somewhat gone retro, with many popular drinks returning, such as those made with Grand Marnier, Spanish and Port Sherries for after dinner digestifs. For those who are Rye consumers, Hooper notes Johnnie Black is a celebrated brand, along with Crown Royal Harvest Rye for its distinctive taste of selective grains. The latter whisky was also rated as the favourite of Jim Murray, author of the Whiskey Bible. A connoisseur and an ambassador with so many drinks to choose from, what’s Hooper’s potion? He is fond of Talisker Scotch whiskeys, especially the exclusive, Isle of Sky, which is produced at a remote distillery in Scotland. He says it’s the “smokey” taste that captures his taste buds and makes it a great sipping whiskey. Despite the recent trend for high-end liquors, Diageo offers products at many different price ranges, and they are all flavourful. Diageo sells alcohol internationally, and through the Liquor Control Board of Canada, which is its biggest venue for sales. Hooper also owns a bar, Rush Lane & Co. on Queen Street West in Toronto. 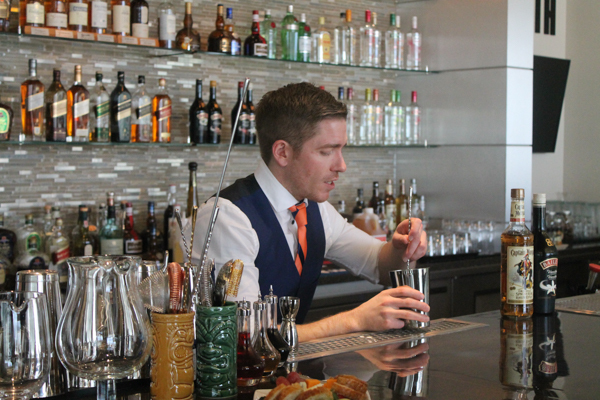 The world of spirits is a competitive industry, Hooper says Diageo always tries to “shake it up and keep up with the trends.” Diageo is known for its World Class Bartender competitions held in deluxe spots throughout the world. Last year’s finals were held in South Africa, and the preliminary semi-finals in many countries are also exciting events. Hooper has attended many competitions involving the U.S. and Canada in many beautiful destinations like Miami. As a former bartender, Hooper said the judges look for invention, creativity, flair and expression. While bartenders juggling bottles is somewhat passe, they are still showcasing their presentation skills through style and sophistication that are a part of their personalities. There is less “slight of hand,” but still “flaring” where drinks are set on fire, usually through chemical interactions, he said. The initial round of the final competition is timed, and the speed round has bartenders making ten cocktails in ten minutes. Anything can happen, and usually does. The judges want to see different techniques, glassware and presentation for all ten concoctions. Then they taste-test the drink. Diageo is all about entertaining, and bartenders need to create a memorable experience for its patrons, he said. Hooper describes his team of ambassadors as passionate and talented, and they instruct other bartenders to help make socializing exceptional. Now at 32, Hooper recalls beginning bartending at 18 years of age. In the past, many people viewed bartending as a way to pay their college tuition, and as a stepping stone to other careers, but not a career in itself. However, Diageo has taught Hooper nothing less, and it shows.